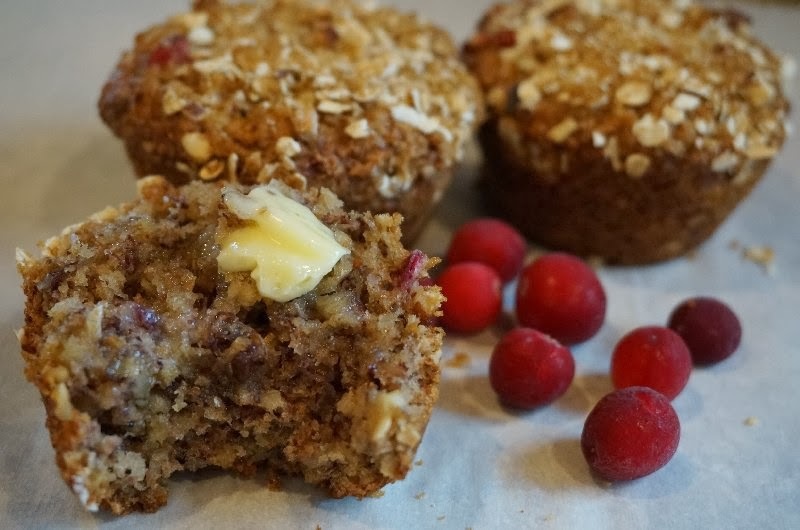 Keep a bag of cranberries in your freezer so you can make these muffins any time of year. Add pecans and set aside. In another bowl, beat egg. Add melted butter and chopped cranberries and stir to mix. Add wet ingredients to dry ingredients and stir only until mixed. Place in muffin pans, filling cups to about 2/3 full. Sprinkle each muffing with topping. Bake at 375º for about 20 minutes or until tooth pick inserted into centre of muffin comes out clean. Immediately loosen from muffin pans and remove to a rack to cool. THis sounds very naughty! Not legal for sure.....thank you for the recipe I can't wait to try them. Cranberries were on sale at 99 cents (US) per bag at my market recently, and I loaded up! Can't wait to try this recipe. I have some cranberries in my freezer right now - these look delicious! These look amazing! What kind of oatmeal would you use? Regular or quick cooking? I used the quick oats. I made these GF and they were moist and delicious! I made these wonderful muffins, and they are so delicious! So moist they almost fall apart. I did, however, substitute the cranberries for some fresh strawberries. I'll have to buy some cranberries and try them that way, too. So good, and good for you! I made these today and they are very yummy! I used 50/50 flour & oatmeal instead of the bran, added a bit of cinnamon to the topping and left out the pecans since I didn't have any. I will definitely make them again.